Jeff left Kat, now a NYPD detective, abruptly 18 years ago, same time her NYPD detective father was shot dead by gangsters. Heartbroken, Kat goes on with her life, which now 18 years after her father died and her fiancee left her is so-so. She drinks too much, doesn’t have a boyfriend and her partner at the station is an idiot. So when her friend sets up a profile on a dating page, Kat is not really that reluctant although she does have reservations. But she goes home and checks out the site. Just as she is leaving, she sees Jeff, her great love, the one who not only got away but went out of her life completely. Too intrigued and with memories floating to the top of her mind, she contacts Jeff through the online dating page, but things doesn’t turn out as they are supposed to. Or how Kat had imagined. Rather than forgetting the whole thing, Kat can’t let it go, and when it seems like there is more to Jeff’s story and the dating page, she gets more and more involved. At the same time, she is trying to get her boss to accept that she looks into the shooting of her father once again, all the while she is dealing with a sick friend who also knew Jeff back then, her mother, her mother’s friends and her idiotic partner. 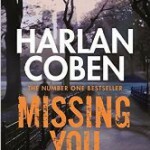 Missing You by Harlan Coben is an easy read with a couple of semi-weak plots. The characters are rather one-dimensional and the ending was simply ridiculous. The book is well written though, but not one I would recommend if you want something to keep you on the edge of your sofa while reading. Harlan Coben, Missing You, Orion 2014.